UPSC is conducting Engineering services examination for recruitment of 602 seats in category mechanical engineering, civil engineering, electrical engineering and electronics & communication engineering. UPSC ESE 2016 is conducted by UPSC for recruitment of IES officers. (a) A candidate for this examination must have attained the age of 21 years and must not have attained the age of 30 years on the 1st January, 2016 i.e., he/she must have been born not earlier than 2nd January, 1986 and not later than 1st January, 1995. Minimum eligibility criteria for UPSC Engineering Services Examination 2016 is candidate must be a degree holder of their respective branch. Every candidate, on being finally recommended by Commission will be required to undergo medical examination as and when so decided by the Ministry of Railways (Railway Board) irrespective of the fact that he/she has appeared for such medical examination in the past and found fit/unfit on the basis of earlier examination. This year UPSC announced approximately 602 including 20 PH vacancies for Engineering Services Examination 2016. Indian Railway Stores Services (Civil Engineering Posts). Indian Defence Service of Engineers (Civil Engineering Posts). Executive Engineer (Civil) P & T Building Works Gr. ‘A’ Service. Assistant Executive Engineer (QS & C) in Military Engineer Service (MES) Surveyor Cadre. Central Power Engineering Service Group ‘A’ (Mechanical Engineering Posts). Assistant Executive Engineer Group ‘A’ (Mech. Engg. Posts) in the corps of EME, Ministry of Defence. Central Electrical & Mechanical Engineering Service (Mechanical Engineering Posts). Central Electrical and Mechanical Engineering Service (Electrical Engg. Posts). Assistant Executive Engineer Gr. ‘A’ (Electrical Engineering Posts) in Corps of EME, Min of Defence. Indian Railway Stores Service (Telecommunication/ Electronics Engineering Posts). 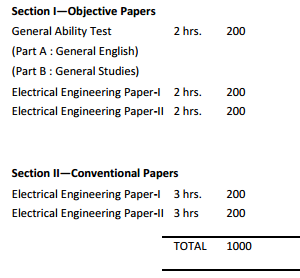 Central Power Engg. 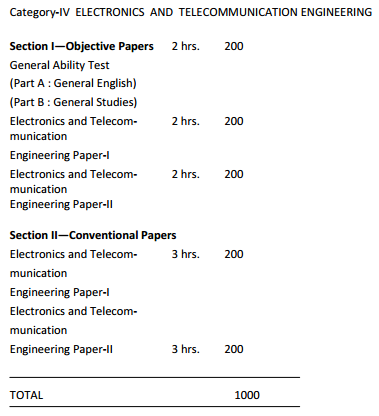 Service, Group ‘A’ [Electronics and Telecommunication Engg. Service]. Indian Telecommunication Service Gr. ‘A’. Junior Telecom Officer [General Central Service Group ‘B’ Gazetted Non- Ministerial]. Admit card for UPSC Engineering Services Examination 2016 is available on UPSC website three weeks before the exam date. In case of any guidance/information/clarification regarding UPSC Engineering Services Examination 2016 applications, candidature etc. candidates can contact UPSC’s Facilitation Counter near gate ‘C’ of its campus. Telephone No.011-23385271/011-23381125/011-23098543 on working days between 10.00 hrs and 17.00 hrs. Part I.—The written examination will comprise two sections—Section I consisting only of objective type of questions and Section II of conventional papers. Both Sections will cover the entire syllabus of the relevant engineering disciplines viz. Civil Engineering, Mechanical Engineering, Electrical Engineering and Electronics and Telecommunications Engineering. The Standard and syllabi prescribed for these papers are given in Schedule to the Appendix. 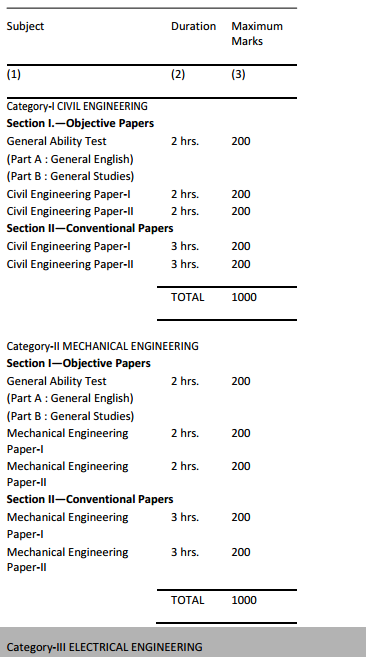 The details of the written examination i.e. subject are given below. For complete information refer UPSC ESE 2016 information brochure.